Plain flour / maida is kneaded into soft dough along with wheat flour and seasonings. The dough is rested for a while before kneading into a parata. The rolled out paratha is then cooked on flame till golden brown in color. Serve plain flour parata with any chole or any gravy curry of your choice. Makes: around 3 Servings of Plain Flour Parata. In a mixing bowl, mix together plain flour, wheat flour, salt, sugar, soda bi carb into soft dough adding cold water a little bit at a time. Keep covered and rest the parata dough for atleast 30 minutes. Take each portion of the dough and roll into thin rectangle shape. Brush the surface of the rectangle with little ghee and roll the longer edge of the rectangle to form into a long cylinder. Now take one end of the cylinder and roll into a coil and press the coil lightly to form a disk. 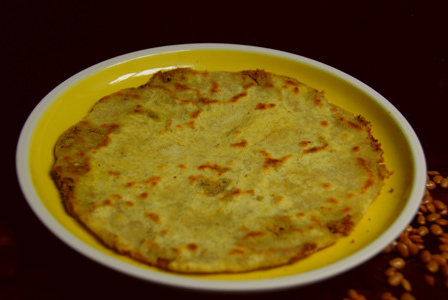 Brush the surface of the formed disk with little ghee and roll into thick 7 inch parata. Heat a flat pan on medium low heat, place the rolled out parata on the pan. Cook on one side till light golden brown, turn on the other side and lightly press around the ends and cook till this side becomes golden brown as well. 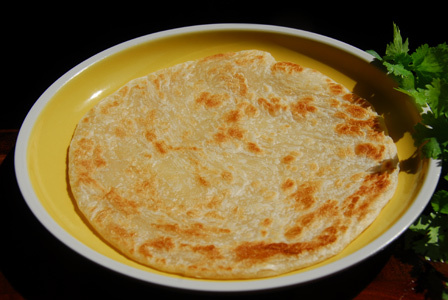 Remove the plain flour parata onto a plate and repeat the same with remaining rolled out parata. Serve plain flour parata with any chole or any gravy curry of your choice. Notes: Make sure parata is cooked well before removing from heat. Suggestions: Thicker the parata, more time it takes to cook. Variations: You can also add crushed red chili while kneading the flour for little spice. Other Names: Plain Flour Parata, Maida Parata. This is instant dosa prepared with wheat flour and rice flour and the batter doesn’t need any fermentation. Grated carrot and other spices are added to the dosa batter and is then poured onto hot pan and roasted till dosa turns golden brown. 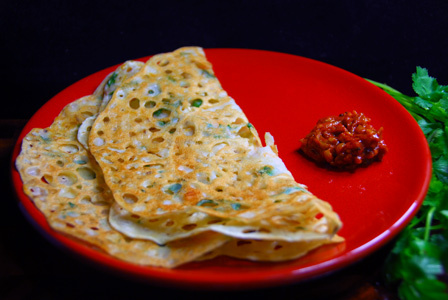 Serve wheat dosa with any pickle or chutney or with sambar. Makes: around 8 Wheat and Rice Flour Dosa. Peel, remove ends, wash and grate the carrot. In a mixing bowl, mix together wheat flour, rice flour, grated carrot, green chiles, cumin seeds, chopped cilantro and salt. Add enough water to make it somewhat thin batter. When pan gets hot, pour a ladle full of wheat dosa batter on pan in circular motions. Try to fill up any big holes and form into around 5 inch diameter dosa. Don’t spread the dosa with back of the ladle. Reduce the heat a bit and cook on this side for around a minute before removing from heat. Repeat the same with remaining wheat dosa batter. Serve wheat dosa with sambar or with any chutney of your choice. Notes: Make sure wheat dosa is cooked well and turned brown before turning on other side. Suggestions: If the dosa doesn’t come out of the pan, make sure dosa batter is not too thin. If dosa comes thick, make sure batter is not too thick, and adjust the batter accordingly with water. Variations: You can also add finely chopped onion or chopped nuts like cashews to the wheat dosa batter. Other Names: Wheat and Rice Flour Dosa, Godhuma Dosa. This is a quick and tasty burfi with whole wheat flour. Wheat flour is roasted in ghee till it turns light golden in color. Then the grated jaggery and dried coconut powder is added to the wheat flour. 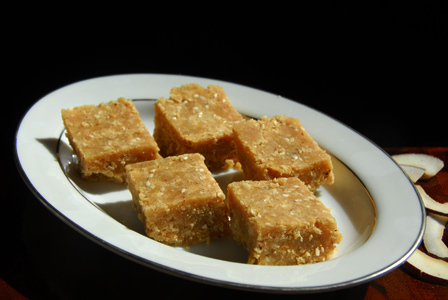 Milk helps in moulding the wheat flour mixture into burfi or ladoo. Makes: around 12 Wheat Flour Coconut Burfi. Grease a 7 X 5 inch dish with a drop of ghee and keep aside. Mash the jaggery into powder without any big chunks with help of a pestle. Grind dry coconut pieces into fine powder using a spice grinder. Add wheat flour and fry for around 5 minutes by stirring continuously. Once wheat flour turns to light golden color, stir in jaggery powder, dry coconut powder and sesame seeds. Cook on low flame till the jaggery starts to melt (around 2 minutes). Add milk to wheat flour mixture which makes it turn wet and crumbly. Pour the cooked wheat flour mixture into greased dish. Press the warm wheat flour mixture with back of a small bowl or wide spatula to tighten it into a block. The top becomes soft and while the mixture is little warm, make perforations to cut later into 2 inch blocks. Let the golpapdi cool off to room temperature before you carefully cut them again into pieces. Store tight in a clean dry jar and serve wheat flour burfi as a snack or dessert. Notes: Make sure not to overcook once the jaggery is added. Suggestions: Warm up the jaggery in microwave for couple of seconds to ease the mashing with pestle. 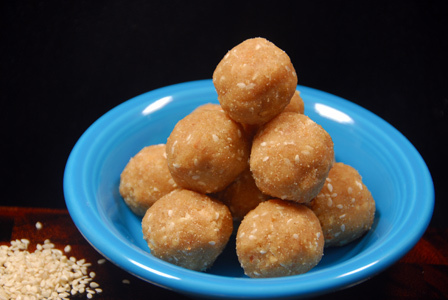 Cooking jaggery for long time might harden it and its practically impossible to form the mixture into a burfi or laddu. Variations: You can also add any sort of dried nuts or dried fruits to the wheat flour mixture. You can also make the wheat flour mixture into small balls by greasing the hands with little ghee. Other Names: Wheat Flour Coconut Burfi, Goduma Pindi Kobbari Burfi. Horse gram / ulavalu / kulthi is soaked overnight and cooked in enough water till soft but not mushy. The cooked horse gram is then ground into paste and tempered with spices. It is then stuffed and rolled out into parata. Serve horse gram parata with any raita of your choice. Makes: around 3 Horse Gram Parata. Wash and soak the horse gram in enough water overnight. Next day refresh the water and pressure cook in around 2 cups of water for 4 – 5 whistles. Strain the cooked horse gram and reserve the liquid. Grind the horse gram into paste with enough salt. Make sure not to add extra water until necessary. When mustard seeds start spluttering, add chopped green chiles. Stir in ground horse gram, turmeric powder and red chili powder. Mix well, adjust the seasonings and remove from heat. In a mixing bowl, mix together wheat flour, some of the reserved horse gram water and salt. Knead the dough into soft and nonsticky mixture. Take around 3 tbsps of the prepared horse gram mixture and place it on the disk. Heat a flat griddle on medium heat, brush quarter tsp of oil all over the griddle. Add around quarter tsp of oil on uncooked side and turn it over to let it cook. When both sides cook with brown spots, remove horse gram paratha onto a plate. Serve horse gram paratha with mango pickle and with any raita of your choice. Notes: Make sure to cook the stuffing until most of the moisture is gone. Suggestions: If the paratha is not cooked properly, put it back on low heat and cook till its done. If the stuffing tends to come out while rolling the dough, apply a thin patch of wheat dough to cover. Or make sure to stuff just enough stuffing so it doesn’t come out. Variations: Finely chopped onion and cilantro can also be added to the horse gram mixture while preparing the stuffing. Other Names: Horse Gram Parata, Ulavala Paratha, Kulthi Parata.